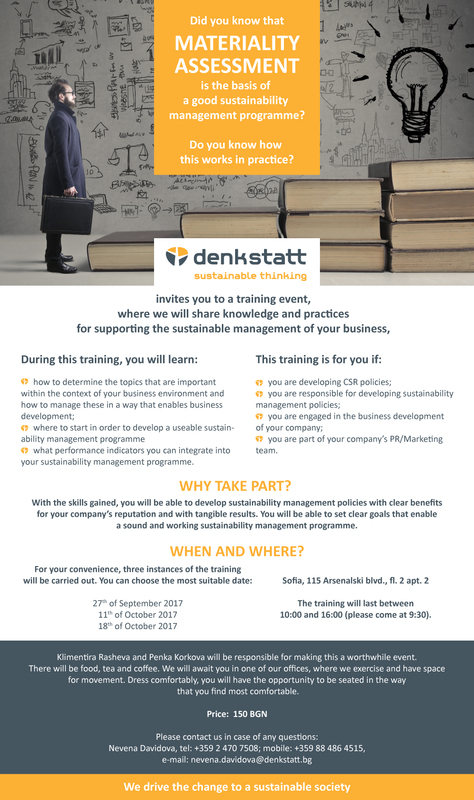 AmCham members are invited by denkstatt to a half-day training dedicated to creation and management of a meaningful sustainable development program. Participants will understand how to determine the significant impacts of the company’s business, or so called Materialality Assessment. Knowledge of how important topics are identified is the compass to create an applicable sustainable business development program. There are 3 possibilities to attend the training: 27 September, 11 October and 18 October. – What performance indicators you can integrate into your sustainability management programme. – you are part of your company’s PR/Marketing team. With the skills gained, you will be able to develop sustainability management policies with clear benefits for your company’s reputation and with tangible results. You will be able to set clear goals that enable a sound and working sustainability management programme.